Edvard Munch, The Scream. Painted in 1893. Earlier this summer, The Eight-Year-Old stumbled onto the concept of derivative art. She looks up various works of art on her Daddyo’s iPad, then redraws them as portraits of Tigery. You can see her first effort, the Tigery a Lisa, here. 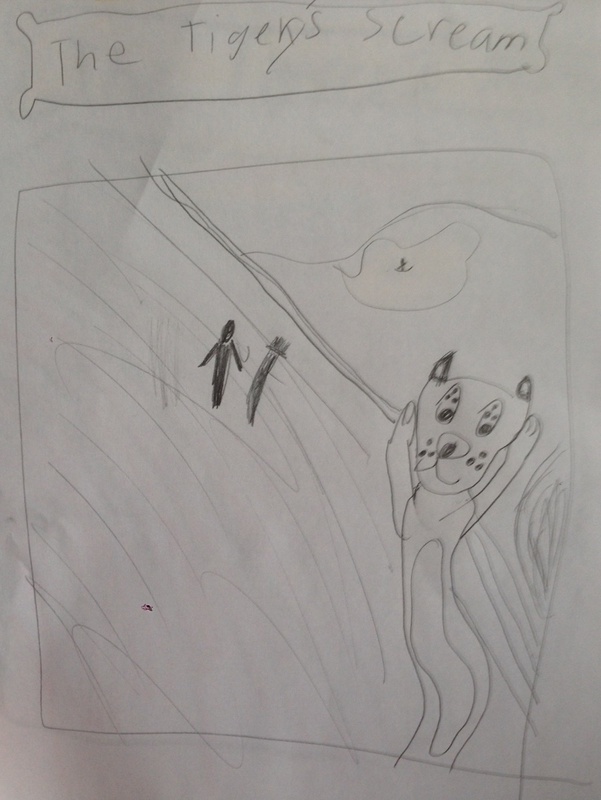 This week, The Eight-Year-Old and her buddy Tigery are reworking Edvard Munch’s The Scream. According to the Edvard Munch website, Munch painted The Scream in 1893 after hearing a heart-rending scream while out on an evening walk. Although some details of the painting are autobiographical, such as the fact that the two companions in the background represent the two companions who had left Munch moments before he heard the scream, the figure in the painting is not so much a physical self-portrait as an emotional one. The flowing curves of the figure in the foreground rob him of any identifying features. He (or she, I suppose) becomes a pure reflection of the swirl of emotions the mentally disturbed Munch experienced upon hearing the scream while out for a walk in the evening alone. Munch, who had a horror of going insane like his sister Laura, abandoned the flowing curves and radical distortions of the art nouveau style shortly after painting The Scream. 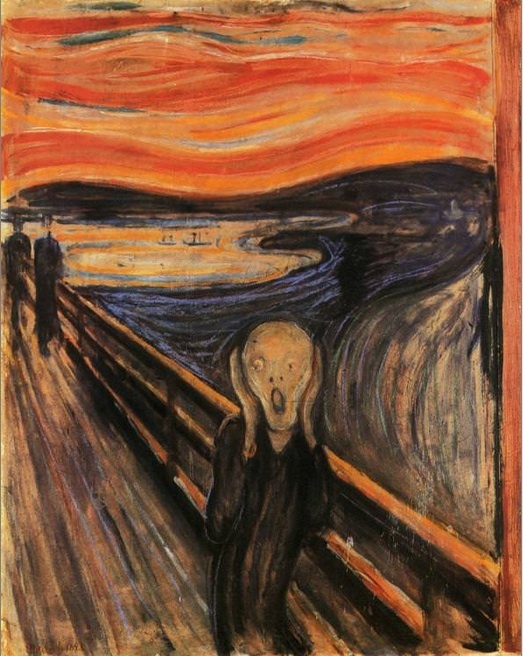 His break with the art nouveau style was so complete and so vehement that he scrawled the words “can only have been painted by a madman” across the top of the version of The Scream that hangs in the National Gallery in Oslo. The Eight-Year-Old is a bit more enthusiastic about her version. Study for The Tigery’s Scream, by The Eight-Year-Old Howell. Inspired by Edvard Munch’s The Scream. 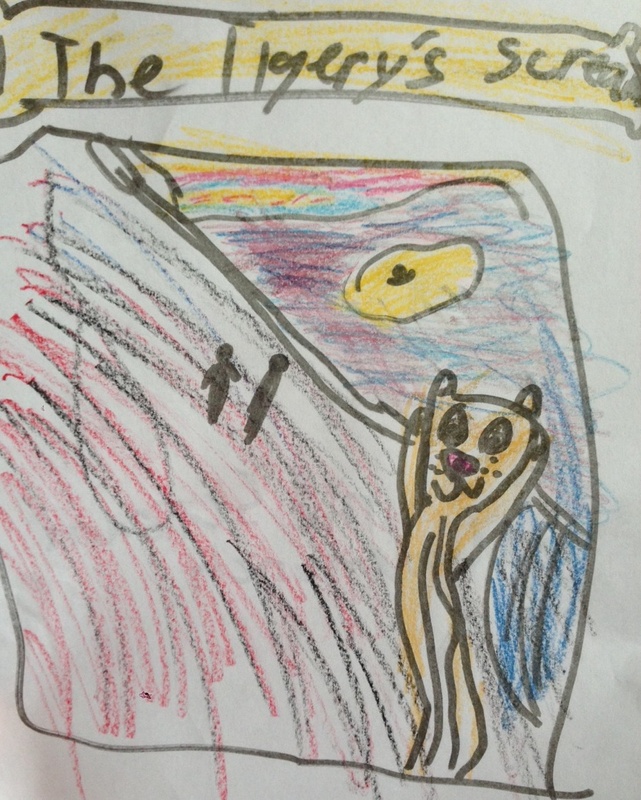 Final version of The Eight-Year-Old Howell’s The Tigery’s Scream, inspired by Munch’s The Scream. The Scream made a great album cover for a very rare psychedelic band called Morgen. Love the album thought the vocals are very much of an acquired taste.